At recent school level (K-12) ed-tech conferences I’ve witnessed a larger than expected amount of fear-mongering, prognostication and exaggeration. There’s also been a great number of presentations about analytics, pronouncing as “here now” or impending many data-related technologies that are arguably not achieved. I thought it was worthwhile scrutinising some of these claims. My critique is likely to become outdated in the near future (at least I hope it will) but is intended to be a general reflection of the state of analytics in schools in 2017. I have seen a number of people claiming student-data-related reports are analytics. What defines analytics is the analysis of trends, usually relating to behaviours, to allow prediction. I would also add that the point of analytics is to promote proactive responses. Anything less than this is simply a report, regardless of how many graphs are included. Another claim I have noted is the prediction that, with “analytics” in hand (or more accurately reports as I have seen), teachers will transform education. Simply providing more information to time-poor educators is unlikely to encourage change. Where analytics have the potential to encourage positive change in education is through highlighting where action is needed and prompting teachers to undertake that action. Analytics tools need to be following trends silently in the background, incorporating new information as it becomes available, making predictions and proactively prompting action when thresholds are passed. As the technology of analytics filters down from the Web to higher education and towards schools, some of the rhetoric about “big data” is naturally transmitted along with those ideas. However, in schools, there is not really a large number of rich data streams to be compared. In higher education analytics are employed to track participation and submissions, primarily to determine “students at risk” as it relates to drop-outs and also to placement funding. Student activity in higher education is focused on activity in LMSs where most document sharing and assessment takes place. It is a focused, rich source of behavioural data. In schools, blended learning will remain a focus for the foreseeable future. Also, the purpose of analytics in schools is more about improving student outcomes. The set of data streams is quite different at these earlier years of education. Attendance is the richest source of data, but even that is prone to errors and anomalies. Some schools have LMSs, but utilisation varies, making it difficult to compare students or even focus on a single student across courses. Common assessment information tends to be summative and describes learning across periods such as terms or semesters, not days or weeks. In order for analytics to be feasible, schools need to mandate more frequent points of electronic assessment and additional streams of information need to be added, such as pastoral and attitudinal information. Ultimately, I think we still have a way to go. When I was a student, the only way of requesting information from student families was by using paper notes. In many schools today, that is still the case and the number of forms is ever increasing as the demands on schools to capture information grows. At Canberra Grammar School, an ongoing project is transforming paper forms into electronic forms, and making quite a difference to the way the school operates. The School uses a proprietary form system called Infiniti from Intelledox, an Australian company based in Canberra, but the benefits could be seen using any forms system, even HTML forms. The forms system is being used to collect information from families and staff. Coupled with an electronic announcements system, this has changed the way the School requests and collects information. There are a number of advantages to using an electronic forms system. Forms feed directly into the Student Information System (SIS), in our case a system called Synergetic, but again that’s not critical. Once stored securely in the SIS, information can be accessed on demand or used to create reports, so information only needs to be provided by families once or when updates are needed. As the forms system knows the user, there is no need to duplicate what they have provided before. When an excursion is undertaken the information is already available, so there are no paper forms to be passed back-and-forth at the bottom of student’s school bags. Because form data is added directly into the SIS, no paper handling is involved. Time saved receiving and handling forms could be estimated to be equivalent to a full time employee; that time is offset by the time taken to developing the form in the first place. However, time spent filling forms and submitting is greatly reduced for both staff and families. If time is money, reduced handling and filling times are saving money, but these are hard to convert into objective figures. It is possible to estimate a few more tangible items, such as printing and postage. In the last 12 months, based on forms completed, relative to past printing and postage practices, we can estimate significant cost savings as shown above. It is possible to use electronic forms as part of a process, passing through a number of people before being finalised. This is has proven to be very useful and simplifies process handling, particularly for staff. We are now discovering processes where there was previously no paper form, or a paper form followed by manual processing, and establishing new processes using electronic forms. Of course, a forms system does not come instantly. We have spent more than two years improving the way we create forms. Several forms have been created over a number of weeks and never used, so there is now an emphasis on involving stakeholders, defining needs and testing. A number of database-integration hurdles have been overcome to get to the point we are now. The forms are used to collect a range of different kinds of information. As well as data collection, the forms system has become another interface to other systems, such as the SIS. Where the SIS has a cumbersome and complicated user interface we can provide an alternative interface that is streamlined for our own context. Coupling this with the ability to drive processes, the forms system is becoming more than just a data collection system. In terms of the SAMR model, we are going beyond substitution (paper for Web) and higher levels of transformation. In conclusion, the forms system is proving itself to be beneficial for the wider School community and we are discovering new uses for the system over time. I recently posted about my experience organising recruiting for IT positions. I though I would follow this up with advice for those on the other end of the interview panel, based on my experience as someone involved in and responsible for hiring staff at a number of organisations. Much of this advice is relevant to any job applicant, but some is specific to IT positions. If you are applying for a position, avoid applying for numerous positions with the same CV. This is something that is obvious when panel members read applications. Look for the positions that you are seriously interested in, research the organisation and take the time to customise your CV for the position. If you are applying for a position above an entry level position, a covering letter that addresses the selection criteria is expected. You should be able to show that you are capable of covering each criterion. As an IT professional, when writing your CV and covering letter, you should be able to demonstrate capable word-processing skills. Many people think they know how to use a word processor, but if your skills are not more advanced than when using a typewriter, you’re going to meet sticklers like myself who will judge you on your document writing skills. Think about document writing as you would when writing source code. Your document should be structured with headings that use heading styles. Formatting should avoid unnecessary white-space and include proper formatting mechanisms, such as tabs and tables. Unless it is required, submit a PDF, not the word processed document. For most positions, two pages should be your CV length limit. Exceptions are positions in higher education where research background may be expected. Keep your text brief and use points. An easy-to-skim CV will quickly get you to the next round. Consider adding company logos in your experience list. It quickly shows where you’ve been and is eye catching. A quick way to show something relative is with quick diagram, such as years of experience in past positions as a graph or timeline. Some of the most intriguing CVs I’ve seen include such simple diagrams. Should you add a photo of yourself? Some people are against this. In some parts of the world it is expected. I think that if you have a vibrant, friendly smile, I would add a good photo of yourself next to your name. If you are a female applying for an IT position, I would definitely recommend this. If you think spelling and grammar isn’t important for an IT position, think again. Day-to-day communication in IT is written, such as documentation, reports and even bug tickets. If you’re not a native speaker of the language you’re applying in, find a friend who is and ask them to check your writing. So you got the call and you’re heading for the interview. Don’t waste your time waiting anxiously; get prepared. Do more research about the organisation. See if you can determine what technologies the organisation is using that may be relevant to the position. Look for information about history, corporate structure and current newsworthy events. If you are given the names of the interview panel members, look for information about them and their roles; this may help you answer interview questions from them in the most appropriate way. At the end of an interview, you’re often given the opportunity to ‘reverse the tables’ and ask questions yourself. This is a chance to demonstrate the research you’ve done and leave a good impression. Being ready to ask questions shows you have envisioned yourself in the position and are enthusiastic about working in it. Have a few more questions that you will ask so you can pull them out selectively. It’s OK to ask about salary expectations for the position if that hasn’t been covered. Many interviewers will ask similar sorts of questions. See my guide for some examples. Think about occasions where things have worked in past positions and where they have failed. Think about relationships you’ve had with fellow workers, where that was successful, where you had conflict and how you dealt with that. Write some of these cases down. Be prepared to be honest; answering dumbly that you “can’t think of an occasion where something has gone wrong” can be viewed as dishonesty. When presented with a set of items to remember, people tend to remember the first and the last items better. When marking assignments, markers will often fall into patterns over time, biasing submissions they see early or late in the process. Interview panels will be more open to the first interviewee, critical of following candidates as they hope for someone ‘just right’, but the last applicant has the best chance to swoop in and prove that the whole depressing series of interviews was worth it after all. If you have any opportunity to nominate your time-slot, see if you can get in last or, if not, then first. You’ve made it in the door. You looked good enough on paper, but now you have to prove you’re ready for the job. As well as probing you about your skills and experience, much of an interview is about picturing how well you will work with the people within the organisation. An interview can draw you from the bottom of the list to the top, but a single answer can drop you out of contention. As much as we may be casual about attire in IT on a daily basis, avoiding fashion trends and false pretences, what you wear to an interview should be a step-up from the norm. In some cases, that may mean full business suit for ladies and men. See what people are wearing there and go a notch higher. If you’re not sure, it’s OK to ask what to wear to an interview. You may be eager and definitely want to give yourself buffers so as not to be late, but showing up early is a bit annoying for interview panels who are trying to keep to a schedule. Showing up early sets in motion a series of actions that eventually interrupts someone who may subconsciously judge you. Be there on time or a couple of minutes early; if that means lurking in the carpark until your time, do that. Your opportunity to warm up and share what a great person you are comes at the beginning. Don’t skip straight to the skills and experience, however keen you are to demonstrate these. Imagine the interview panel are your best friends; even if they appear weary after a series of interviews, you need to be smiling and respectful of the panel and their process. When answering questions, be as specific as you can. Listen to the questions as they are asked and, even if you have to take a few seconds before answer, consider how you will answer. Giving general answers may cover the question, but it won’t make you a standout applicant. If you can use specific examples from your experience, this is a plus: you’ve been there and done that. Avoid waffling; a concise answer is good. Look at the expression of the person asking the question to see if they are satisfied with your answer to the question, otherwise ask for clarification. Consider the role of the person asking and what perspective (technical, managerial, end-user) they are asking the question from. Be confident about technical skill questions; if asked about something you haven’t worked with previously, answer honestly but show an interest in learning new skills. Almost all interviews will include a scenario; expect some verbal role-play, written response, coding task or a combination of these. Your answer to a scenario is not as important as how you answer it. The scenario may test how you might interact with clients. When faced with a conundrum, it’s more likely that you’re being tested on whether you can come up with a workaround, rather than following corporate rules or passing decision-making responsibility upwards. If you’re waiting for a long period after an interview without hearing any news, it’s probably not a good thing. It doesn’t hurt to call up and ask how the process is going. Put your efforts into other positions after a week or so, if you haven’t already. If you were unsuccessful, do ask for feedback. As well as helping you with future applications, it shows you’re a mature person and keeps you in mind should the chosen application not work out. Over my career I’ve been involved in interviewing and selecting new staff for IT positions on numerous occasions. I’ve learned a few tricks along the way and I thought I should share those. A lot of these techniques are generalisable to positions peripheral to IT and elsewhere. It helps to have more that one person doing the interviewing; two is OK; three is ideal; four can be intimidating. If the position is really serious and more people need to be involved, create two panels with different foci. Aim for diverse perspectives in the panel members. If you’re a manager, involve a technical staff member and a support staff member, such as someone from HR. Without going into too much detail, the panel that will interview should be the ones selecting who should be interviewed. Start separately and blindly review all the CVs. Bring together opinions into a collaborative space, such as a shared spreadsheet. After each panel member has rated candidates, come together to decide who to interview. Be open to disagreement as others may have spotted potential that you have not seen. Consider rounds of interviews with the most likely candidates first. When you have a list of candidates, you need to invite them in. Negotiating a time is best achieved over the phone. Offer the candidate opportunities within a specific window, but be accommodating. Once a time is set, send a formal invitation that introduces the panel and their positions; this establishes perspectives for the candidate. Set expectations for where to go, when to arrive, what to wear and how long the interview will take. You may want to prompt the candidate to undertake some research into your organisation by directing them to online resources and work spaces. It’s good to have a set series of questions going into the interview. All panel members should agree on the script before interviews start. Use a common document with names beside each question (rather than each panel member having their own script); this allows you to pass the flow of questions between panel members. If you have a script from a previous position, review the questions and ensure they are relevant to the current position. The script can be duplicated for each candidate so that notes can be inserted, by someone not asking current questions, during the interview. Before an interview, all panel members should take a few minutes to review the candidates CV. Discuss their strengths and peculiarities so that you can focus questions during the interview. having glasses and water poured for the candidate and the panel. Allow the opportunity for each member of the panel to shake hands with the candidate. That first physical contact is disarming and will establish what could be a future working relationship. Don’t arrange seating in a way that is confrontational, such as sitting on the opposite side of a big table from the candidate; a small table is better, with the candidate as part of a formation that is inclusive, like a circle. Start by reintroducing the panel and what they do. This can be quick, but is important to preface the questions you will ask later. The panel leader can do this or each panel member can quickly say who they are and what their role is. The candidate’s CV will tell you about their education, their experience and their skills, but it won’t tell you what kind of person they are, how well they will work with you and how they can apply what their skills. You want a good script of questions that tease these important aspects from the candidate’s brain. Candidates will be mentally prepared to convince you about their professional worth, but don’t jump straight into serious questions. Start by allowing the candidate to settle in and feel comfortable. A good way to achieve this is to ask the candidate to talk about their personal life; if they start drifting into work and skills, redirect them by saying you will get to that soon. How did you come to be here in ___ ? Tell us a bit about yourself as a person. What do you do in your spare time? Tell us about your study. What inspired you to get into IT? You want the candidate to tell you about their experience, but you don’t want a litany that will take up all your interview time. Ask questions that will allow the candidate to showcase them self, while highlighting aspects you are keen to hear about. Without going into too much detail, tell us the places you have worked and your roles there. (If applicable) Why are you leaving your current position? What has motivated you to choose your career path? What are some of the tasks you really enjoy doing? It’s hard to tell when people are being honest. One technique for eliciting humility and honesty is to ask the candidate to admit where they have failed. This may be counter to what the candidate is prepared for and it may be affected by cultural background, but it can give you a good idea of whether you want to work with that person. It’s a good way to distinguish potential assholes. Can you think of a time when things did NOT work out the way you expected them to? Can you tell me about a time you had a conflict with a colleague? How did you deal with it? You should be able to tell what skills a candidate has from their CV, but you want to know if they have real experience or was it something they observed someone else doing. Tell us about your experience with Active Directory? Have you ever written documentation in a wiki? No: what did you use? Have you ever worked with a issue tracking system? How was that used? It’s easy to get stuck on technical skills for an IT job, but non-technical skills are really just as important in the day-to-day working of a successful team. Have you worked as part of a team? What was your role? You want someone who can ‘think on their feet’ and consider alternative solutions. Posing a scenario that seems unsolvable at face value will prompt candidates to demonstrate their ability to think ‘outside the square’. The following example is for a service desk position in a school. It’s been a busy day; you are feeling under pressure and a teacher calls you demanding that you set up an email account for a person who is not an employee but has come into their class to present. This would be against the school’s policy, but you understand the teacher needs to make the class work. How would you deal with this situation? Most candidates will start by stating that they cannot break policy because they want to give you the impression they are honest workers, ready to follow the rules. Some might say they will seek permission from a manager to break the rules. A good candidate will recognise that problems are often not what they are first reported to be and probing into the client’s needs will allow you to consider the problem then create a solution or a workaround. You want to know if the candidate is actually interested and enthusiastic about working in your organisation. Give them the opportunity to share their research and how they have envisaged them self in your organisation. What do you think it will be like working in a ? Allowing candidates to ask you questions is more than a courtesy, it allows the candidate to take control of the interview and demonstrate their strengths and knowledge by probing you about what you do, what technologies you use and how the organisation works. A good candidate will come with prepared questions. Don’t leave yourself open to surprises. What are your obligations and availability? If you are leading the panel, avoid keeping all the curly questions to yourself. Farming some complex questions to another panel member allows you focus on how the candidate is answering the question, following their body language and ‘reading between the lines’. A smooth interview is not rushed, nor is it slow. With good flow, the interview can be comfortable and friendly and elicit the honest answers you are seeking. Build up with some easy questions first. Hand over between panel members when asking questions. Ask questions from the panel member who has the perspective from which you want questions answered (personal from the manager, technical from the technician, organisational from HR). Don’t stick to the script when you want to clarify or probe deeper. Don’t ask questions that have already been answered. A candidate may say they have the skills you require, but it’s hard to judge to what degree that is true. Their CV may have been developed over time, with outside help. Every candidate will say they have good communication and problem solving skills; we all have a self-optimistic bias. Don’t be afraid to take some time to get the candidate to demonstrate their skills. Pretend to be a client with a predetermined problem. Ask the candidate to put them self into a support role and attempt to unravel the problem. Getting the answer is not as important as how they approach the problem. Allow the candidate to answer questions in a quick quiz. You might throw together some basic questions in a Google form or online survey and ask them to provide their answers. Being able to write clearly is an important skill for all IT workers. Set up a scenario and ask the candidate to respond to a pretend client. Writing a pretend email or ticket-update on a machine you provide is an easy way to run this task. If the candidate is applying for a technical role, ask them to resolve a bug or simple problem. This may be something they have to do after they leave you and later submit the response back to you. Be sure the problem requires them to establish a dev environment close to your work environment. If the candidate is applying for a role that involves training, ask them to run a quick training session on a simple technology. If you’re considering this task, you will need to give the candidate notice before the interview so they can realistically prepare. Assessment biases can creep in over time. You can glorify earlier candidates or favour candidates you have seen more recently. Reflecting immediately after each interview is recommended, even if this means delaying the next interview by a few minutes. When you’ve seen all candidates, hopefully you’re in a good position to choose. If none of the candidates are suitable, consider re-advertising. If there is a candidate that is suitable, but you’re not completely confident, remember that you can rely on a probation period if things don’t work out. Don’t forget the unsuccessful candidates. Failing to respond respectfully to unsuccessful candidates puts the reputation of your organisation in danger, whereas an honest response with feedback that will help the candidate in future will be welcomed. Categories: Uncategorized | Tags: education, Interview, IT, job | Permalink. Learning Analytics – Where’s my data? A while ago I wrote a blog about learning analytics from different perspectives giving examples of different analytics based tools that could benefit different users. Since then I’ve had discussions with numerous people, many of whom have great ideas for analytics tools, but I’ve discovered there is a disconnect between the analytics people want and their understanding of where to find the data. To get from question to answer there needs to be an understanding of where the data are located and how they can be brought together. My intention with this blog is to show you where to find data for analytics in Moodle. The database tables are used by Moodle and its plugins for data storage. They are able to be queried for information about users, and their involvement, as well as course and site information. I would estimate that more than half of the data needed for analytics are stored in these database tables. The limitation of these data is that they are not historical – they represent the current state of the system. There is some historical data, for example Forum posts and Chat sessions, but for historical information generally you need logs or observers. One advantage of drawing from database tables rather than logs is that such data can be gathered in real-time, all the time, which is not advisable for log data (more on that later). Here is a summary of the data in Moodle database tables. I’ve categorised the data by the perspectives relevant to analytics. Here are some examples of how data in Moodle’s database tables could be used for learning analytics. It’s not a comprehensive list, but perhaps there are ideas here that could inspire some great analytics tools. Currently the logging of events in Moodle is undergoing change. 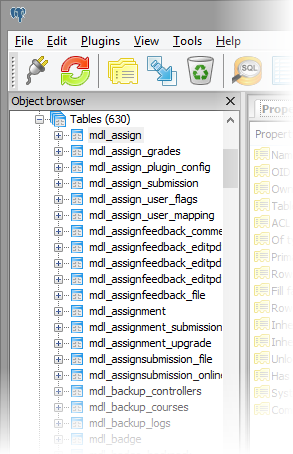 Rather than referring to past implementations of logging, I’ll be more forward looking, referring to events and logging as used to some extent in Moodle 2.6 and used fully in Moodle 2.7. The new logs are richer and more focussed on educational activities. From logs it is possible to extract information about events that have taken place. Here are some relevant aspects of events that are captured. Here is a list of verbs (action words) that are used with events currently. This set may grown. One of the problems with logs is that they grow very large. This makes efficient searching and processing of log information almost impossible, particularly on larger sites. With richer event information being captured, there are also events being recorded from more places in Moodle. There is the potential to direct log information to log stores outside of the Moodle database. The intention of this change is to allow searching and processing of logs without impacting the performance of the Moodle server itself. There is also the potential to export log data to files for filtering and analysis outside Moodle. So it is possible to get detailed log information, but this cannot be used in real-time, say for a block or a report that combines logs with other information. One way to capture event information so that it can be used in real-time is with observers. As each action takes place an event is “triggered” within Moodle and observers can “observe” events based on certain criteria. The new logging system is an event observer that consumes all events that are triggered and stores them (to one or more log storage plugins). It’s possible to create new observers that can focus on a subset of events, store relevant information so that it can later be presented efficiently. If you were interested in, say, creating a report that focussed on enrolment actions, you could allow the report to observe enrolment events, store records in its own table and then present the results to users appropriately, any time it was needed. The report could even make use of messages to send out alerts when necessary. 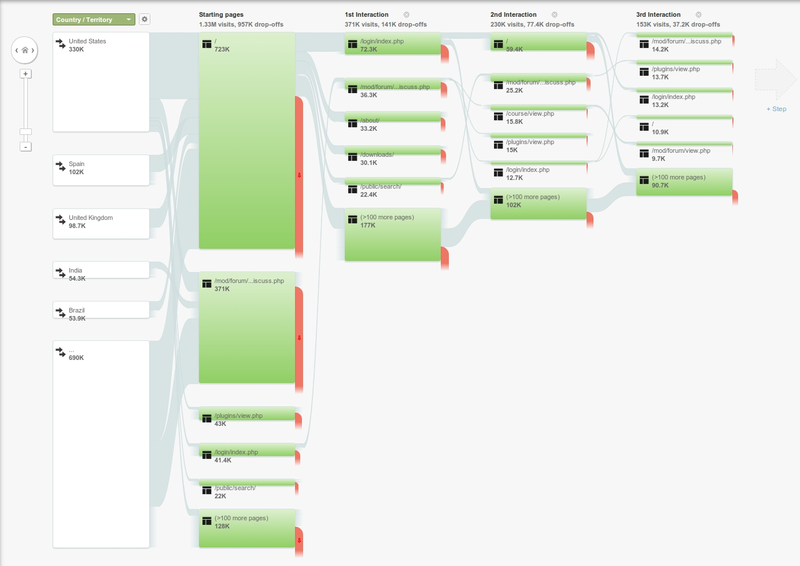 the paths they are following through your site. This information is useful to administrators wanting to ensure their Moodle site is catering to users’ needs. To discover learning analytics from Google Analytics, it is possible to drill down into usage information, This will not yield the same sort of information as the Moodle database or logs, instead showing patterns of behaviour. This information could potentially be fed back into Moodle as Google provides an API to query analytics data, which could be presented in a Moodle report or block. Another relevant click-tracking tool is the Moodle Activity Viewer or MAV. This is a system in two parts: a server-side component that collects course activity usage statistics and a browser plugin that takes the page delivered from Moodle to your browser and overlays the page with colour to turn the course page into a heatmap. This shows teachers where the focus of activity in a course is taking place. Could this understanding be built-in? Unfortunately, at this stage, there are no simple generic mechanisms built into Moodle that allow you to freely gather and combine information without writing code. There are some exceptions attempting to allow generic report writing, but I don’t think these are simple enough for ordinary users yet. Currently, if you have specific questions that can’t be answered using standard Moodle reports, the best way to get the answers you want is by writing (or get a developer to write) a plugin (report or block). Hopefully this guide so far will provide an understanding of what data are available and where to find them. Is there a possibility to create the reports without coding them from scratch? One potential future step would be to allow plugins (and Moodle itself) to be able to describe the data they store. With this meta information, it could be possible to use a generic tool to gather and combine specified information on-the-fly and tweak the criteria as needed. This would allow access to the rich data in the Moodle database (with appropriate security constraints, of course). It could also be possible to create a generic observer that can be configured on-the-fly to consume events of interest and record them. The current logging and events system APIs allow such alternative logging. Providing a sense of what events could be observed would be the challenge here, but at least events are now somewhat “self describing” meaning meta information is recorded with the coded description of the event objects. For administrators interested in the sort of user information that Google Analytics reveals, it is possible in Moodle to determine a user’s browser, OS and device type. Moodle already does this to allow page customisation for different combinations of these factors. It would not be a great step to capture and present this information in a report. Google could probably do this better, but perhaps you’re not too keen to allow Google to snoop on your students and their learning activities. Moodle logs could be used to infer the paths and behaviour of students, but this would be a very costly exercise, requiring a great deal of computing power, preferably away from the Moodle server. The final challenge then is to go beyond data gathering and analysis to provide tools that can use this information to support teaching; tools that help students learn, teachers teach and administrators to cover their butts. Only then will we see the LMS take education beyond what could be achieved in the classroom. The submission deadline for the Moodle Research Conference (MRC2014) is approaching fast. I imagine many people around the world are feverishly preparing their submissions. Unlike most conferences, the MRC draws together people with different experience from many fields who happen to be conducting research in and around Moodle. Being one of the co-chairs for this year’s MRC, I thought I’d put together a guide to help authors. As a researcher, you are never working alone. Basing your research on work that has come before gives you a solid foundation and increases the credibility of your work. Reviewers are not only judging your paper, they are looking at your knowledge of the field. Citing appropriate past research demonstrates your understanding and places your work within your research area. References should be formatted according to the prescribed standard and should provide enough detail to allow a reviewer to find the cited work. Cited works should be primarily from peer-reviewed sources. Ideally, you should be able to demonstrate a need for your current work based on past research. After setting the paper within past research, you should then define the aim of your research and this is done with research questions. Such questions could be phrased as hypotheses, but this is not essential for an MRC paper. Your research questions can be used to define the structure of the remaining paper including the conclusions at the end of the paper, where the answers to these questions should be presented. Without evidence a paper is simply opinion. In order to answer your research questions, you need to gather and analyse evidence. The evidence should answer the research questions, proving or disproving something – either outcome is valuable to report. The evidence you present could come from one (or more) of many sources such as experimental results, user data gathered in Moodle, surveys, case studies, etc. You should be able to show how the evidence you have gathered builds on the past research you have written about earlier in the paper. Even if your paper is focussed on the the development of a new tool (such as a Moodle add-on), you should go beyond a simple description, showing evidence that the tool works in practice and can have benefits. MRC papers must be written in English. Poor writing distracts reviewers from the important research work you are reporting. If English is not your first language (or even if it is) get someone else to proof read your paper before you submit it. Also consider the flow of your paper: each paragraph should follow on from the last and each section should lead into the next. You are arguing the value of your work and your argument should seem logical. The MRC, like most conferences, provides a template to demonstrate the expected paper format. Rather than copying the styles shown, use the template as the starting point for your submitted paper. Use the styles in the template rather than manipulating text to look like the styles. Doing this is easier and is something all word processor users should be able to do. It also ensures all papers in the final proceedings are consistent. If your paper appears different, reviewers will feel responsible to point this out and that will detract from the review. Look through the Moodle Research Library for examples of accepted papers from past MRC conferences. The MRC uses double-blind peer review, so authors don’t know who is reviewing their work and reviewers don’t know who has authored the paper they are reviewing. If the reviewer sees you’ve done a poor job anonymising your paper, that may impact their review. See the guide to submitting papers for things to check when anonymising your document. A picture is worth a thousand words. Presenting data as a table or chart makes it easier for readers to understand. Screen captures are a great way to show tools in use. All tables and figures should be labelled and there should be a reference to these items within the text to include them at appropriate points in the flow of the document. Simon, Carbone, A., de Raadt, M., Lister, R., Hamilton, M., & Sheard, J. (2008): Classifying Computing Education Papers: Process and Results. 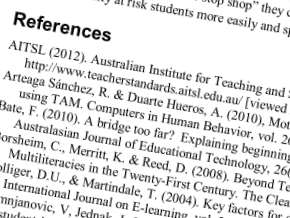 Proceedings of the International Computing Education Research Conference (ICER2008), Sydney, Australia, 6-7 September, 2008. 161 – 171. Simon, Sheard, J., Carbone, A., de Raadt, M., Hamilton, M., Lister, R., et al. 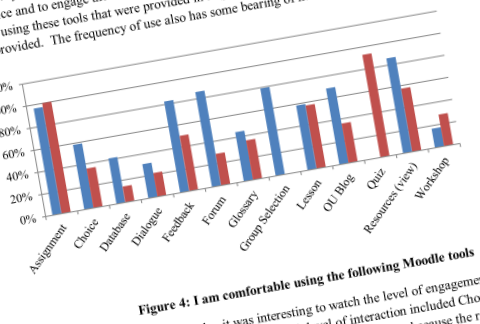 (2008): Eight years of computing education papers at NACCQ. Proceedings of the 21st Annual Conference of the National Advisory Committee on Computing Qualifications (NACCQ 2008), Auckland, New Zealand, 4-7 July 2008. 101 – 107. I was asked by a teacher of software development if I could give an overview of how we use the Scrum Framework in a real-world, open source project, here at Moodle. Being a former development teacher myself, I could not refuse. The video below outlines the Agile software development processes followed at Moodle HQ. If you’re a developer or someone training to be a developer, this will be relevant to you. Forgive my ums and ahs. It’s been a while since I was in teacher-mode. Categories: MoodleDev | Tags: Agile software development, moodle, Moodle HQ, open source project, Scrum Framework, software development | Permalink.